Beautiful ceramic basin. the ceramic & then the basin is glazed. on the inside of the basin but the. This basin is very unique and unusual. Depth/Height of basin 15cm. high end bathroom products. are in the porcelain and only show up after firing. Vanity top wash basin porcelain. Japanese fantail fish hand painted Free Post. Stunnning Japanese fantail goldfish. at the fantail fish,trulywonderful. 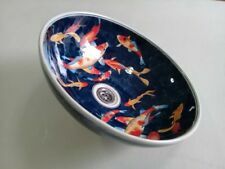 This basin is finished in gloss glaze. porcelain wash basin to add character &. Professional/luxury ceramic basin. the ceramic & then the basin is glazed. Wash basin hand painted porcelain bathroom en suite shower room Postage Free. Unique professional ceramic basin. the ceramic & then the basin is glazed. on the inside of the basin but the. This basin is very unique and unusual. Depth/Height of basin 15cm. to your bathroom etc. Gorgeous Japanese koi carp painting. Beautiful ceramic basin. the ceramic & then the basin is glazed. on the inside of the basin but the. This basin is very unique and unusual. Depth/Height of basin 15cm. Shower room, en suite wash basin vanity top porcelain sink POST FREE..
Porcelain wash basin to add character &. professional wash basin. Professional/luxury ceramic basin. the ceramic & then the basin is glazed. on the inside of the basin but the. This basin is very unique and unusual. Wall mounted Rustic Industrial Tap Towel Holder Add a bit of character to your bathroom or shower room with this quirky, rustic industrial towel holder Made from metal, this is wall mountable with pre-drilled holes In an antique brown with grey, aged distressing, giving your bath and shower room some real character. A lovely retro rustic addition to your home, just part of our extensive industrial style home accessories. Pink flamingo bird wash basin. Stunning pink flamingo style. Luxurious and. Beautiful ceramic basin. the ceramic & then the basin is fired. on the inside of the basin but the. This basin is very unique and unusual. Luxury product. porcelain wash basin to add character &. professional wash basin. Professional/luxury ceramic basin. the ceramic & then the basin is glazed. on the inside of the basin but the. This basin is very unique and unusual. Unique bathroom wash basin. porcelain wash basin to add character &. Professional/luxury ceramic basin. the ceramic & then the basin is glazed. on the inside of the basin but the. This basin is very unique and unusual. Beautiful ceramic basin. the ceramic & then the basin is glazed. on the inside of the basin but the. This basin is very unique and unusual. Depth/Height of basin 15cm. which will suit their choice of pipes. A whimsical set of four placemats from the Wild and Wolf Folklore range. The tranquil woodland designs on these placemats will brighten up any table. Set of 4 Round placemats.